Frank Shapleigh was a key figure in the artistic communities of St. Augustine, Florida, and the White Mountains in New Hampshire. He displayed a deep personal enjoyment for painting sweeping, peaceful landscapes, as well as detailed studies of old barns and kitchens. Shapleigh was uniquely dedicated to portraying history through his work, developing a deep sense of place and depicting a rugged American past. Shapleigh had a remarkable ability to move between high society and the world of the everyman, which served him well as an artist of his time. As one of the first to hold artist-in-resident positions at grand hotels, he maintained a studio at the Crawford House in the White Mountains from 1877 to 1893, while winters were spent at the Ponce de Leon of St. Augustine. While in residence, Shapleigh held open hours in his studio and entertained wealthy patrons at social events. Meanwhile, pursuing his studies of historically significant architecture and everyday settings necessitated that he mingle with rural homeowners. Born in Boston in 1842, Shapleigh trained at the Lowell Institute of Drawing before traveling abroad, studying with Emile Lambinet of the French Barbizon School in Paris and making frequent studies of European genre paintings in the Louvre. He served in the 45th regiment of Massachusetts during the Civil War, and then traveled with fellow Bostonians to California to paint the Yosemite Valley. Striking out on his own, he became the first artist to paint Hetch Hetchy. While working as a portraitist in Boston, he visited North Conway, New Hampshire, in 1873, and opened a studio there in 1876. He established himself among the other artists working in the White Mountains, which included Albert Bierstadt, Edward Hill, William Morris Hunt, George Inness, and Samuel Griggs. He was often joined by John J. Enneking and Benjamin Champney when painting outdoors. In St. Augustine, he worked alongside Martin Johnson Heade and William Staples Drown. 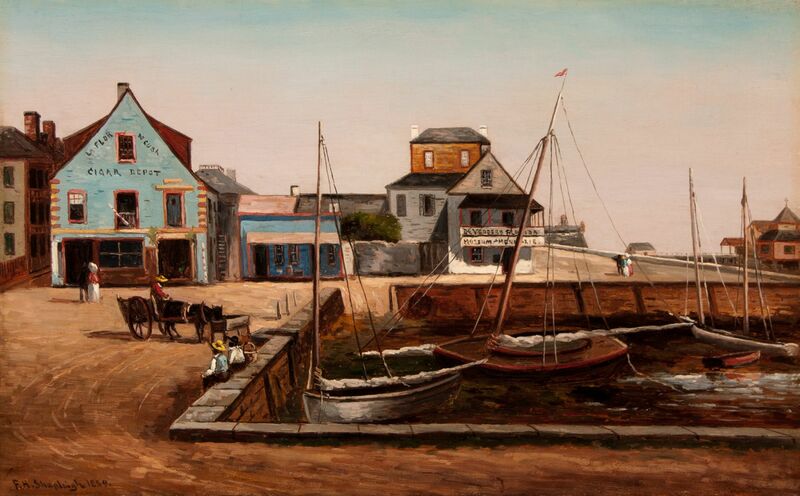 Shapleigh was elected to become a member of the Boston Art Club at the young age of thirty-two, and made a distinct impact for the interplay of architecture and landscape in his works, painted from unusual perspectives. He faithfully described the locations on the backs of his canvases, preserving his subjects for posterity. Shapleigh settled in Jackson, New Hampshire in 1896, where his studio contained numerous early American antiques. He passed away in 1906.